You don’t have to lift a finger; you don’t have to spend a dime. 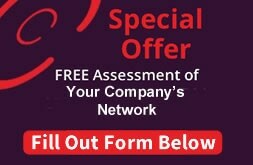 Our Network Assessment is FREE. All you need to do is give us a call or complete the form at right. In return you’ll receive a report detailing what your network is actually doing as opposed to what you think it is doing. List of users, their status, their last login, and their password strength—identifying possible security risks, including inactive users whose access should have been terminated. List of major applications and versions—identifying possible conflicts or inconsistencies, including unsupported operating systems. Analysis of event logs—uncovering potential problems you may not have detected yet. List of inactive computers—identifying assets that are not being used. Test of internet speed and performance—ensuring that you are getting the service you paid for. List of security holes and warnings, including missing security patches—revealing external vulnerabilities. EverSafe’s Network Assessment report includes information on server and workstation aging, storage and free space, and drive capacity. It helps identify problems, such as unauthorized users accessing or modifying your network. It includes recommendations for preventing problems, such as cutting back on administrators (too many users with high-level access increase the risks to your network); strengthening passwords; adding security patches; upgrading or replacing computers; and disabling inactive accounts. With your EverSafe IT Network Assessment in hand, you can begin to recover or maximize valuable assets, remove internal and external vulnerabilities, correct current problems, and plan for your future needs. EverSafe’s Network Assessment gives you a realistic assessment of your assets, procedures and policies and a firm basis for strategic planning. You can call upon us for proactive monitoring, 24/7/365 support, worry-free technology and much more.